You’ve probably seen those interlocking garage floor tiles and interlocking foam mats often used in children’s playrooms. Those are kind of similar, in concept, to the ever popular carpet tiles people are using in their homes these days — except carpet squares don’t have interlocking pieces. They go together seamlessly. Carpet tiles have actually been around for many years. They were originally used to cover the floors of high traffic areas in place like airports, hospitals, and offices. They are extremely durable and show very little wear in high-traffic areas. They’re easier to remove and replace than other — more traditional — forms of flooring. They offer the same easy-to-clean surface as ceramic tile and wooden floors do. Carpet tiles are squares of carpeting that are attached to vinyl squares. FLOR carpet tiles are one of the most popular brands that you may have heard of. They do not require any special tools for fitting or installing inside your home. They stay in place on hardwood floors thanks to their non-slip bottom. For added security, you can use double-sided tape. The edges are easy to secure down with glue, if desired. Carpet tiles are extremely durable and long-lasting. Carpet tiles can be used in a variety of different places — from bathrooms and kitchens, to bedrooms and hallways. 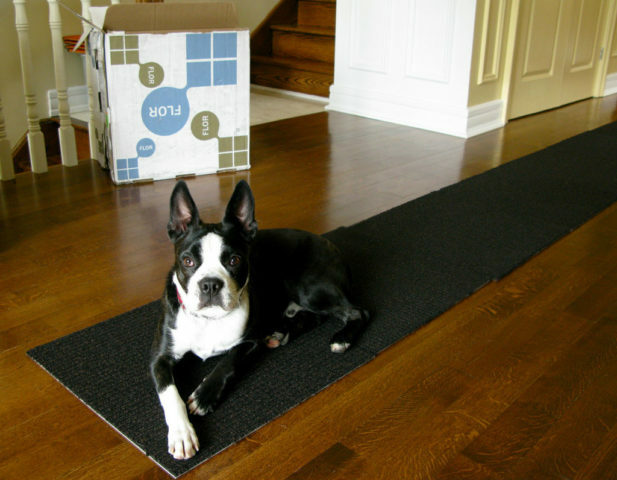 #1 – Carpet squares are easy to install and don’t require a professional. This makes them the ideal alternative to traditional carpet and a great way to save money. #2 – They are easy to transport — because they’re lightweight and portable — making it easy for you to get them from the store to your home in your own vehicle. #3 – Carpet tiles can “warm” up an otherwise “cold” room. Physically, they are much warmer to walk on than hard surfaces, and they help to deaden sound at the same time. #4 – Their ability to repel moisture ultimately prevents staining. Moisture and bacteria cannot penetrate the surface of carpet squares — which makes them ideal for high-traffic areas and rooms where there are commonly spillages (like kitchens and play rooms). #5 – Some carpet tiles can even be used outdoors — to cover a deck, patio, garage floor, or the surrounding area of a swimming pool. For example, carpet squares placed around a pool will ultimately help prevent slipping. 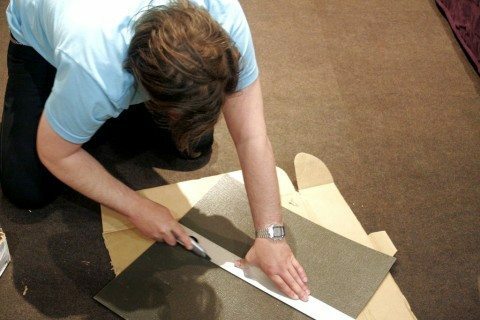 #6 – When installing carpet tiles, you don’t have to deal with the upheaval of clearing the floor like you would with a traditional roll of carpet. You can simply move one item or piece of furniture at a time, fit the tiles in that area, and then move on to the next area. #7 – Carpet tiles can add a great pop of color to an otherwise drab room. #8 – Staple some carpet squares to a corkboard or to a lightweight piece of wood and make a fun bulletin board! #10 – They’re perfect for small spaces and areas that are hard to fit inside the home — like closets, powder rooms, and laundry rooms. #11 – Carpet tiles can be used to cover up old flooring — even damaged flooring. 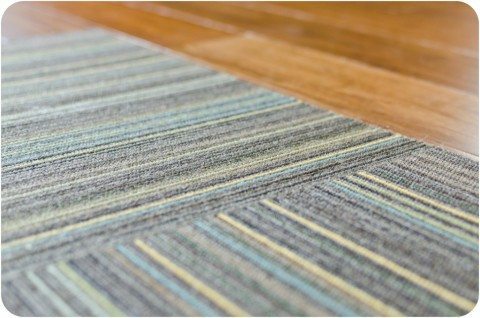 #12 – If you’re renting a house or apartment and you can’t make permanent changes to the space, carpet tiles will give the room a whole new look without damaging the flooring underneath. #13 – You could even use carpet squares as a ‘rug’ on top of the carpet itself. This would work great in a bare hallway, in front of a door, a sink, or wherever else you can think of! #14 – Cover a plywood cube of wood or an old wooden pallet with carpet tiles for a DIY ottoman. #15 – There are so many styles and finishes to choose from that you won’t have any difficulty finding carpet squares to match your decor and your budget. #16 – You can use carpet squares to create your own fun and unique designs. Depending on the space, it may be fun to mix and match 2 or more unique patterns or styles of carpet tiles in one room! #17 – They can be cleaned just as any carpet — just use regular vacuuming, steam cleaning, or wet extraction. #18 – You can even affix carpet tiles to your walls! You might want to arrange them in a unique pattern or design as wall art. Or you might prefer to cover every square inch of the wall (or walls) in a particular room — for warmth and sound-deadening effects. #19 – Give an old worn out table a facelift by lining the entire top of the table with carpet squares. This also adds some texture and color to the room. #20 – Carpet tiles are perfect for oddly-shaped spaces, due to the fact that they’re smaller and easier to work with than thick pieces of carpeting. Plus, they can easily be cut into smaller sizes (to make your own decorative trim, fit around door frames, etc. The only downside to carpet tiles is the fact that they must be installed on hard (smooth) dry surfaces. In the end, carpet tiles can be a refreshing change from other types of flooring. Let your imagination run wild. If you decide to try carpet squares in your home, you will get many years of pleasure from them and save yourself a great deal of money at the same time!